Just when everybody is celebrating about the everyday run in January, we advised everybody that February is likely to reach a peak, followed by a sideway month. In January in a radio interview by DJ Di Cong in FM958, we already issued our prediction. In February, we also wrote a few articles stating our viewpoint. So far everything has been going to plan. 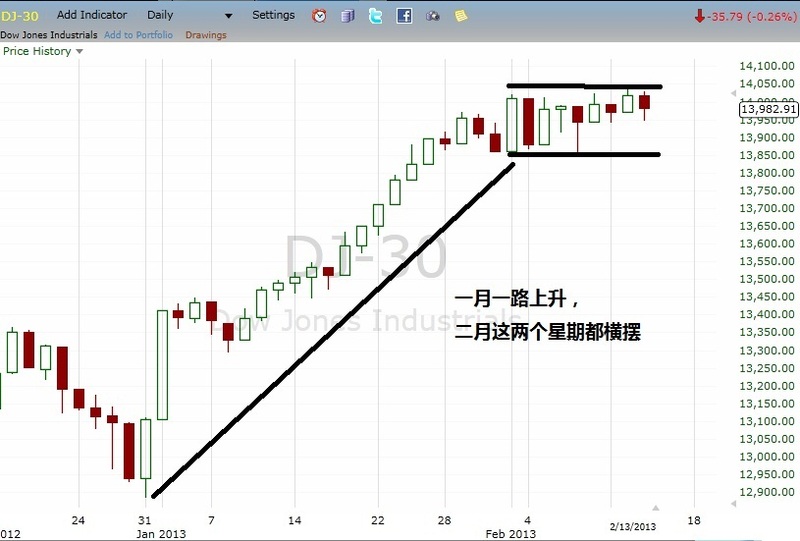 Dow has been traveling in a tight tight range although I do not think the peak is reached in Feb yet. 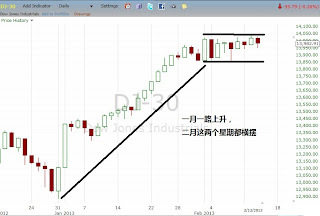 Do not believe in analysts telling you about how bullish they think it is for 2013. These people are nowhere to be seen when fiscal cliff occurs. Do not believe in your remisiers telling you to buy here and there. 95% of remisiers don't warn you. There are still 5% good hearted ones. The irony is 99% of you don't trust the 5% who warns you. ;) Find a good and experienced one is important to your success! Let us see if March drops. We believe that there is a good chance. Latest is beginning of April. We hope it drops and drops big so that we can enter BIG again!!! In the meantime, you can still buy individual stocks and play only short term while the market is sideways. That really puts your trading skillset to the test. If not, JUST Get your CASH READY and hope the market drops in March or beginning April!! !